1. A modern scalloped look that'll be easy to put together — the footboard, frame, legs, and wooden slats are placed in the zippered compartment in the back of the headboard for easy assembly! 2. An upholstered metal headboard and frame made with non-slip tape on the wooden slats to prevent your mattress from moving. 3. 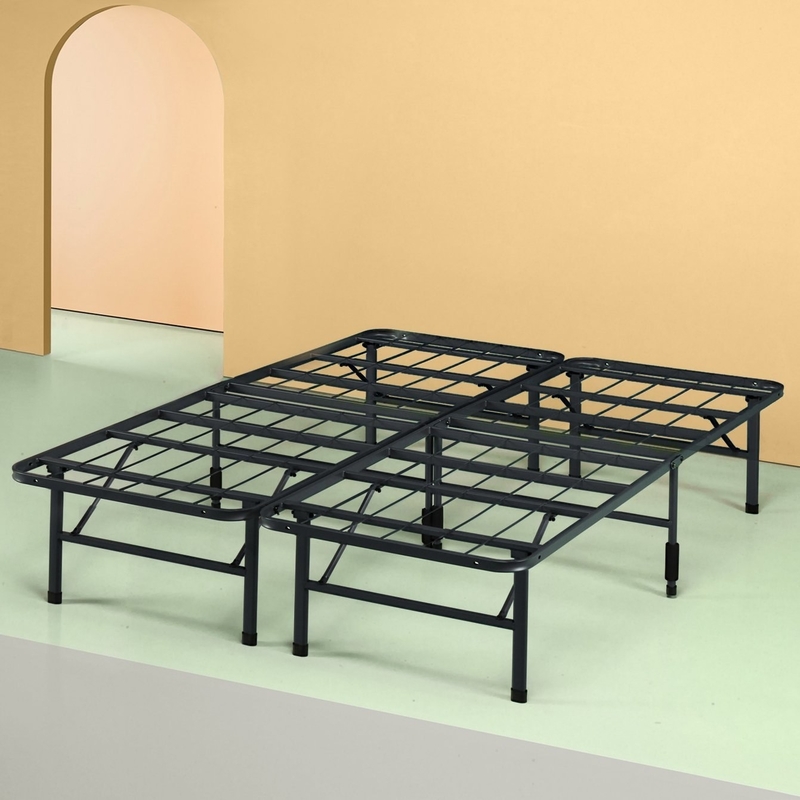 A steel platform frame designed with no box spring needed so you save money in the long run. Plus, this supports memory foam and hybrid mattresses! 4. A metal and wood platform bed, because this baby has foam padded tape added to the steel frame for noise-free use. You know, for when you're jumping on the bed! 5. A steel bed frame with a bit more flair to it to match the other design elements in your room. 6. A linen quilted headboard, because your room needs that extra touch of luxury but at an affordable price. Promising review: "Whoever is looking for a bedroom suite, this is the frame to buy! It actually looks like a $2000 bed and is very well made. I love it for the price. It is just gorgeous, thanks Amazon." —Lora M.
7. A sleek black metal frame for a contemporary design option with minimal effort required. 8. A rustic pine finished bed made with a five-inch frame that'll complete your room with a natural look. No more pine-ing over mood boards, your aesthetic is here and it's under $200! 9. A sophisticated option because your room should look expensive without actually spending a fortune. 10. A pretty day bed for a clever way to add bedding or extra seating somewhere in your comfortable home. 11. Or a transitional day bed with a trundle so you never have to worry about hosting your entire family during the holidays. 12. A natural-looking wooden frame that'll charm you right to sleep with how smooth it is! 13. A detailed frame with an eye-catching design so you don't have to over-decorate your room if you'd rather not. 14. A super-simple frame perfect for anyone who is looking for a quality option at an affordable price. 15. A faux-leather bed frame with an upholstered and padded finish that'll faux-sure elevate your bedroom instantly. HGTV is shook! 16. A striped metal option for anyone looking to buy a frame with a bit of a low-profile. 17. A very sophisticated look so you can finally become the kind of functioning adult that has an actual headboard. 18. 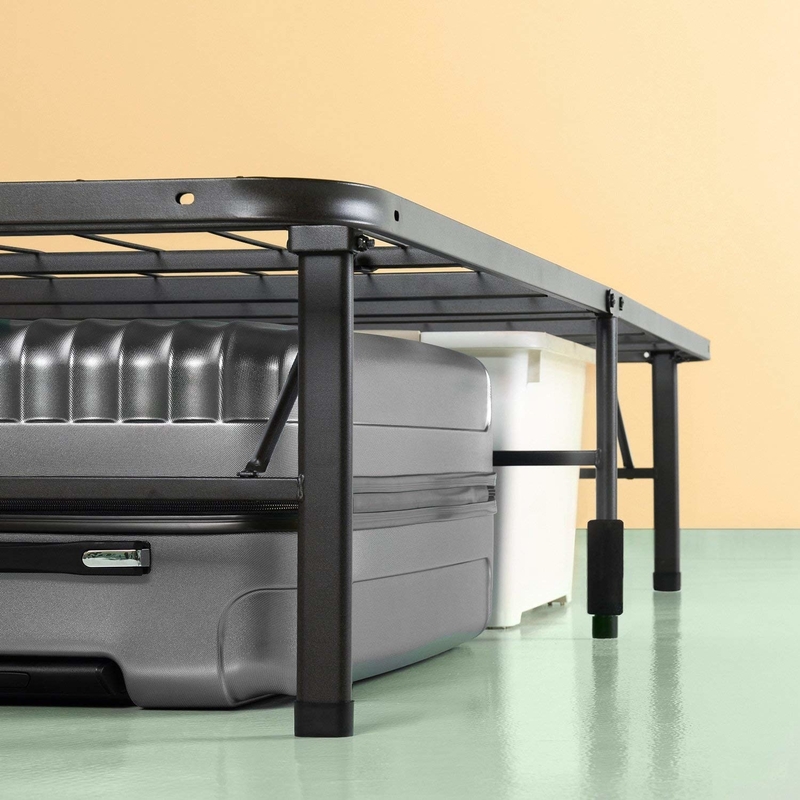 A noise-free frame with much-needed under-the-bed storage for anyone tired of all their stuff being unorganized. Did I mention it has over 16,700+ five star reviews!? 19. An upholstered platform bed that'll uphold your beautiful bedroom standards at a price that doesn't break the bank! Promising review: "Unlike inexpensive furniture from big box stores like Ikea, it was simple to put together. We had it set up in about 30 minutes. Assembly instructions are short and easy to understand. It only took an Allen wrench and 5-6 screws. I'm impressed by the design of the bed and quality of parts. You can tell the company spent time thinking about how to deliver great design, quality and an easy assembly experience for the consumer. The frame is made of metal, which is sturdier. Another nice touch was the velcro attached to the slats (which support the mattress). It keeps the slats in place on the frame. This is great because they can move around and make noise." —Kris C.
20. A bed frame with a metal and wood combo design to put all other modern frames to shame. Time to quit your day job because you're never getting out of this bed! 21. A platform bed designed with center support legs and an antique espresso finish because you woodn't have to make any compromises on your dream bedroom with this magical find. 22. A junior loft bed frame that'll finish off your kids room in a functional and fun way. Oh and it's currently 75% off, so you're basically stealing it! Complete your bedroom setup with one of the best mattresses you can get on Amazon, one of the best pillows you can get on Amazon, and some of the best sheets you can get on Amazon.